Which scanout diagram is correct while using GSYNC + VSYNC OFF when frame rate is higher than refresh rate? B: Part of the current frame (eg. 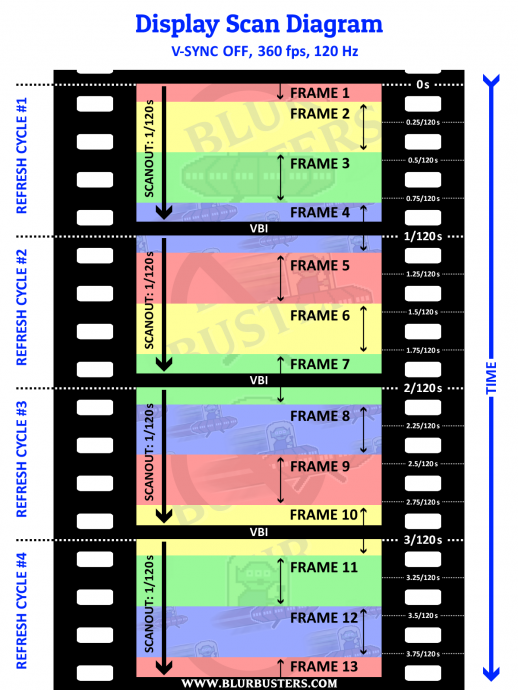 frame 2) will be abandened, the next refresh cycle (cycle 2)starts synchronously with delivery of frame 3 (yellow). This thread is not ideally for display engineering style questions. Those should be posted in Area 51, and not in this GSYNC 101 tweaking HOWTO. This discussion may later (in the next few hours) be moved to Area51 once you've read the reply. The same situation happens with 360fps during 120Hz GSYNC+VSYNC OFF and 120Hz FreeSync+VSYNC OFF. There are implementation differences behind the scenes for GSYNC/FreeSync but the scanout behaviour (because that's where matters from a human vision & latency perspective: displays painting the refresh top-to-bottom, so top edge of a refresh cycles have photons hitting eyes first) is the same; a new refresh cycle cannot be started until right after the minimum-specified VBI size. For FreeSync, the minimum VBI size is dependant on the EDID/DisplayID advertised by the monitor or the custom resolution configured as the current Vertical Total. FreeSync/HDMI VRR/VESA AdaptiveSync -- all interoperably enlarges/reduces the Back Porch (embedded in the Vertical Total number) changing every single refresh cycle to dynamically space the refresh cycles apart, but can be never be below the minimum allowed number. Microsoft says that D3D12 does not even have FSE and keeps pushing for Borderless mode, which is bothersome because it reduces FPS and can cause stutters... More info on that can be found in educational video from MS here - https://www.youtube.com/watch?v=E3wTajGZOsA . There is no harm for games; the sole difference between the two G-SYNC modes, is that one is only active in FSE, and the other is active across FSE, borderless, and windowed mode. G-SYNC "Enable for windowed and full screen mode" does apply to some non-game apps, however, so you can get the occasional/rare nuisance of certain program windows dropping/fluctuating Hz on the desktop unnecessarily when active/focused on. Even among FSE (Full Screen Exclusive) I've seen some wonkiness occuring for some reason. With the new Windows 10 gaming mode, some windowed applications start behaving as if they're in FSE when they go borderless windowed. There are subtle differences but tearing suddenly appears (VSYNC OFF) or suddenly goes in VRR mode (even when windowed VRR is disabled). This even happens in applications with no true FSE support (Full Screen Exclusive). In many situations, this is often desirable (except in situations when it is not). Even the Chrome web browser behaves this way. When I disable GSYNC and configure NVIDIA Control Panel to use VSYNC OFF for full screen mode -- then I can see tearing in TestUFO animations when I run chrome.exe with the --disable-frame-rate-limit and then I do Full Screen on the browser window via the TestUFO full screen button. Framerates are ultrahigh though, like 1000fps or 2000fps! It's like I forced Chrome into a FSE mode everytime the window is maximized (F11 fullscreen mode). Basically I've forced an FSE-equivalent onto a non-FSE app like the Chrome web browser. I am a competitive player on fortnite, and I would have liked to have the best possible optimization (less input lag possible, and the least tearing), my current configuration is: msi 2080 ti (oc), i9-9900k (oc), and 16 go Ram (4000hz) and a 240hz screen, I set my fps in game at 240, to know that Fortnite at the end of the game is a fps opener and very rarely remains above 240 fps despite all my optimizations and even goes down to ~100 fps, I would have liked to know according to you what is the best possible optimization? So my question is do you have a better optimization? Should I lower the frequency of my screen? Should i cap my fps in game at 140 with 244hz screen ? Use a cap of 237FPS, not 240. This will reduce tearing. Use a cap of 237FPS, not 240. This will reduce input lag. 1) What is better for high competitive game ? Gsync on, vsync on or Gsync on, vsync off ? 2) Lategame, The fps of the game goes down no matter what happens to 80/100/150 maximum, so I inevitably suffer an increase in input lag and tearing, so what can i do ? Mimi wrote: 1) Wwhat is better for high competitive game ? If you get 300FPS, use gsync off. If you don't, then gsync on + vsync on + 237FPS cap should be fine. 2) Have you a idea for the problem of late game in fortnite the fps of the game goes down no matter what happens to 80/100/150 maximum, so I inevitably suffer an increase in input lag and tearing, so what can i do ?